SNA is a 2D acceleration architecture for the open source Intel Linux graphics driver that provides improved X.Org driver performance, and thus, better desktop user experience. The name stands for "Sandy Bridge New Acceleration" and contrary to its name, it not just for Sandy Bridge but for previous Intel graphics generations as well. Here's how to enable Intel SNA in Ubuntu 12.04 or 12.10. According to the x.org wiki (link; cached copy since the page seems down right now), SNA should work with i830-i865G and newer Intel chipsets. You can see some old UXA (used by default) vs SNA benchmarks at Phoronix. 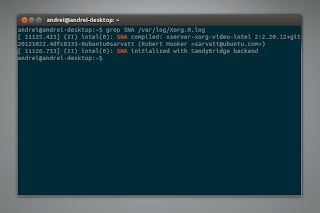 Intel SNA is available in Ubuntu 12.10 without installing any extra packages, but it's not enabled by default. Then save the file, log out and log back in. In my test (using an Intel HD 3000 GPU), there were some artefacts when using Intel SNA in Ubuntu 12.10, which don't occur after adding the Xorg Edgers PPA so if that's the case for you too, follow the steps under the alternative method below. For Ubuntu 12.04 (or for Ubuntu 12.10, if the method above doesn't work properly for you), you can use the Xorg Edgers PPA which has packages with SNA enabled by default for Intel. Warning: this PPA uses Xorg packages from GIT and while I didn't encounter any issues (I've used it for Ubuntu 12.04 and I'm using it now in Ubuntu 12.10), things may break. Use it at your own risk! Then launch the Update Manager (now called Software Updater in Ubuntu 12.10) and update your system. Once the update finishes, log out and log back in (though a restart is probably better since this PPA upgrades many system packages).